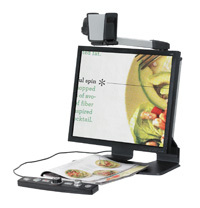 This Week's Featured Advertisement: 1st Generation Smartview 360 Video Magnifiers: $999.00 USD Each!!! Flying Blind, LLC is ecstatic to be running a blockbuster video magnifier special just before the beginning of another school year to give our low vision subscribers a whole lot to be excited about as summer draws to an end. These Smartview 360s provide school-age, working-age and aging users a flexible video magnification solution suited for the classroom, workplace, or home. The 360s integrated camera and 19 inch monitor gives users multiple viewing options for desktop, distance, or personal tasks. It's auto-focus feature, multiple color options, and robust yet flexible magnification capabilities make it the most versatile companion for low vision users of all ages. Imagine being able to complete countless tasks independently and efficiently while fully utilizing your remaining, functional vision! Capture classroom information from a distance, review extensive paperwork at your desk, or enjoy your favorite photographs, and all at a price 60% lower than other video magnification alternatives. These Smartview 360s will provide you the freedom of limitless opportunity at a price tag under $1,000.00 USD! There are a limited number of these units and they will be sold on a first come, first serve basis. Each unit ships with a one year manufacturer's warranty. Price includes shipping within the Continental United States. To be the first to secure one or more of these units please use the Buy Now link included below. For more information or to order this product offline, email featured@flying-blind.com or call +1 (216) 381-8107 today! 4) George McKenzie and Byron Lee of Horizons for the Blind have written another iOS App Review. This time it's for an app called HEARD, a time machine for your ears! "How Can I Find Out Where an Email Really Came From?" "Debunking Battery Life Myths for Mobile Phones, Tablets, and Laptops"
NVDA Tutorial Addendum 1 "Review Modes"